Nigel Gardner, 35, of Livingston, has been charged with murder. Body From Burned Out Car Positively Identified, Murder Charges Filed, LIVINGSTON, November 5, 2010 - On October 5, 2010 the Polk County Sheriff�s Office conducted an investigation into a car fire off of FM 2500 where a body was discovered inside a badly burned vehicle. Investigators with the Polk County Sheriff�s Office determined a possible owner of the vehicle and began conducting interviews and follow up investigations on trying to determine the identity of the person in the vehicle. The body was sent to the Harris County Medical Examiners Office in Houston Texas for an autopsy where the cause of death was ruled as homicide. Investigative leads led to the arrest of Nigel Gardner, 35, of Livingston Texas who was charged with Tampering with or Fabricating Physical Evidence/Human Corpse on October 7, 2010 and was placed in the Polk County Jail under a $50,000.00 bond. At this time Investigators had a suspicion of the identity of the victim but had no proof. DNA was then collected from family members and sent to the Harris County Medical Examiners Office for analysis. On November 3, 2010 the Polk County Sheriff�s Office received a positive identity on the victim who was identified as Raymond Howell of Livingston. 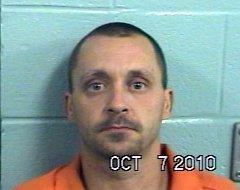 On November 4, 2010 a warrant was issued for the arrest Nigel Gardner charging him with the Murder of Raymond Howell. At the time of the warrant Nigel Gardner was currently in custody of the Polk County Sheriff�s Office and the warrant was served on him while in jail. Justice of the Peace Darrell Longino set a $200,000.00 bond on the murder charge. Woods Fire Leads to Burned Car With Body, Foul Play Suspected, EAST POLK COUNTY, October 8, 2010 - On the afternoon of October 5, 2010, a call was made to the Polk County Sheriff�s Office in reference to a woods fire on FM 2500 North of FM 942. The Livingston Volunteer Fire Department and surrounding agencies responded to the scene and began fighting the fire. Firemen discovered a badly burned vehicle which contained a body that had been burned beyond recognition. The Polk County Sheriff�s Office began an investigation and was assisted by the local and state fire marshal's office, Texas Department of Public Safety Auto theft division and the Polk County Criminal District Attorney�s Office. The body was transported to the Harris County Medical Examiners Office. At time of this press release, it has been determined that the body was that of a white male, however, authorities have not yet made a positive identification of specifically who. The case remains under investigation by the Polk County Sheriff's Office.